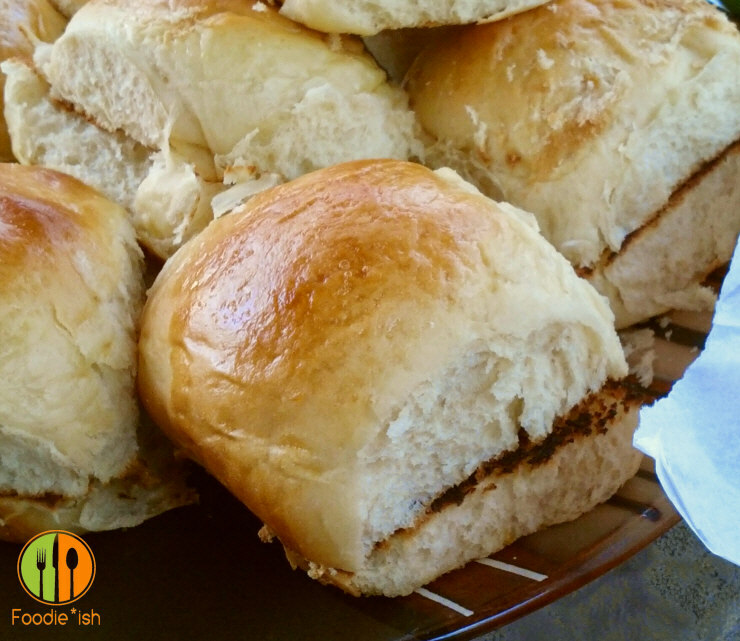 Orange rolls and BBQ… Yes please! My parents came to visit not too long ago, and somehow the stars aligned and we had fabulous cook-out weather. So I took the opportunity to make this awesome pulled pork sandwich. I wanted to really foodie*ish it up a notch, so I thought I’d make my own BBQ sauce, my own apricot coleslaw, and of course I had to fancy-up the bun. I wound up concocting these amazing sweet orange sandwich buns, and let me tell you, I have never paired something more perfectly together. 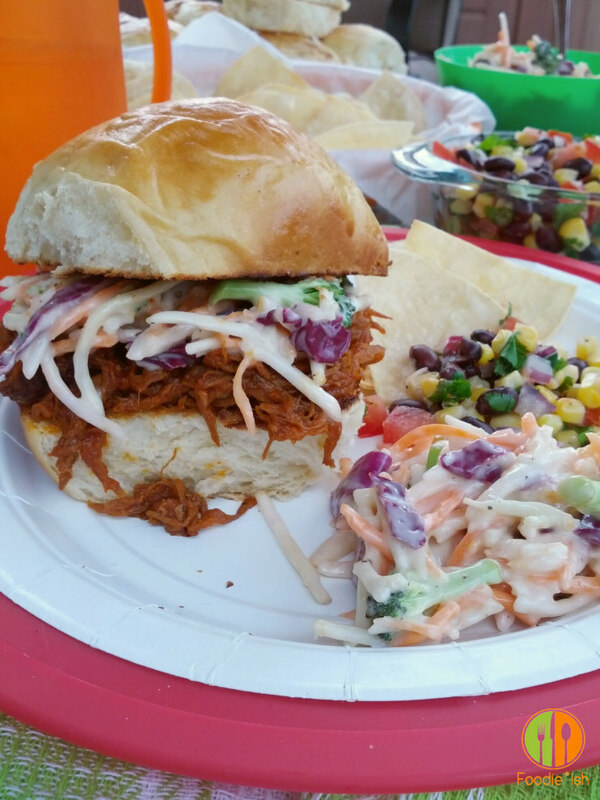 A tangy BBQ sauce, with a slightly sweet and sour coleslaw on a sweet*ish bun with just the perfect hint of orange. Hooooo doggy! 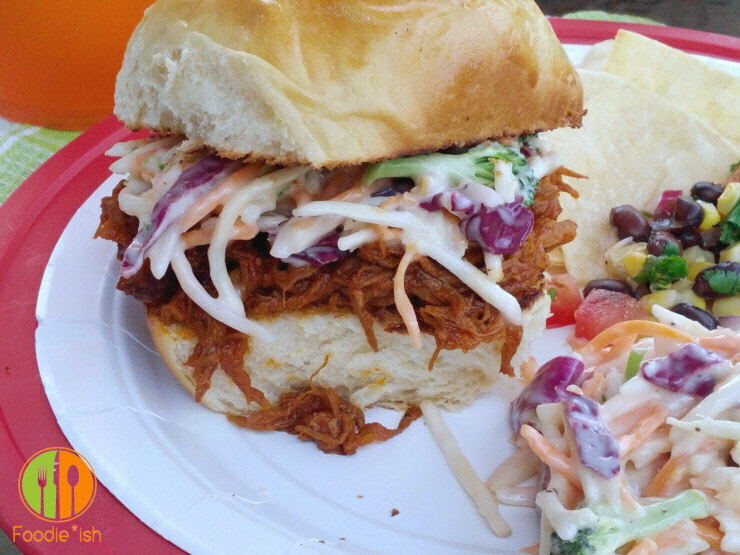 A pulled pork sandwich you could be proud to serve to a BBQ champ! These things were that GOOD! I was a bit concerned how to write this post. I mean, I literally have 6 different recipes that went into this meal. But I figure, the most interesting thing of the whole concoction are those sweet orange sandwich buns since I conjured them from out of nowhere. You can find a BBQ sauce recipe anywhere (and people can be wicked about their sauces, so I’m staying out of that battle royale), and I’m pretty sure you already have a go-to coleslaw. I may still write about my black bean salsa and homemade corn tortilla chips because: A. they were AWESOME, and B. I will never buy tortilla chips again these were so easy and quick and delish…. But for now, the star is the sweet orange sandwich buns that married the BBQ pork and the slaw like they were peas and carrots. If you’ve never made a pulled pork sandwich, it is really pretty hands-off and easy-peasy. I took a pork shoulder, rubbed it down with a bunch of mustard, some chili powder, paprika, garlic powder, a handful of salt and enough pepper to make a grown man cry. Most people will let it sit in the fridge overnight, but I was ill-prepared so I just threw it (actually hoisted it) into the oven at 250 degrees all day (about 9 hours). It came out perfectly moist and delish and pulled apart with a fork (exactly what you want). I have also made pulled pork with boneless pork chops in a crock pot. If you’ve got a fancy smoker, by all means, employ that sucker. But however you do it, low and slow is the key to getting the meat perfect. Once your pork is pulled (which is apparently the Southern term for shredded), mix it up with your favorite BBQ sauce — I recommend something with some tang and some sweet. My current fav is Smoky Jon’s BBQ sauce. Seriously, it is the best bottled sauce I have ever tried. Tastes like homemade, except more perfect than that. 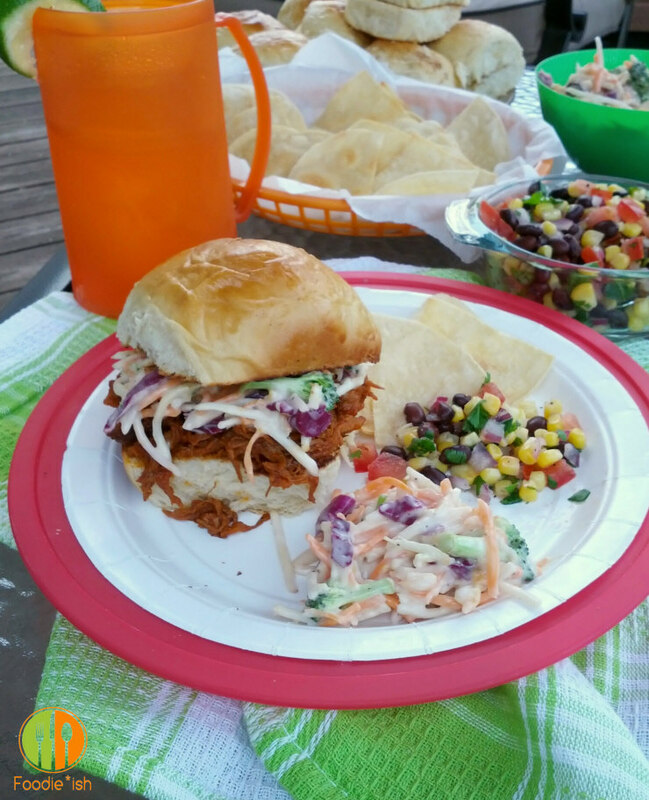 Anyhoo, take your BBQ smothered pork and load it all on these sweet orange sandwich buns, top it with some coleslaw, and bam! You’ve got yourself a pulled pork sandwich that will blow your mind! Ready to blow some minds with the world’s best pulled pork sandwich? Well get your KitchenAid and head over here for my delicious sweet orange sandwich bun recipe. 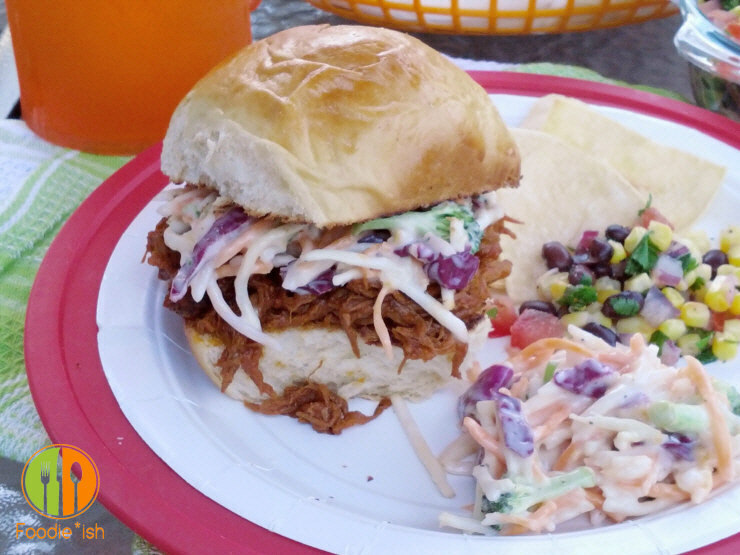 A perfect complement to tender BBQ pork and tangy coleslaw, creating a pulled pork sandwich that will blow your mind! Combine yeast with warm milk and sugar and let proof until yeast gets foamy, about 5-10 minutes. Add 1 cup flour to the bowl of a standing mixer. Add yeast mixture, orange marmalade, orange juice, butter, salt and one egg. Using the paddle attachment, mix to combine thoroughly. Add one cup of flour and combine thoroughly. Add a third cup of flour, mix thoroughly and switch to the dough hook. Add your final cup of flour and knead with hook attachment for 10 minutes. Your dough will be well combined and slightly sticky. Coat a large bowl with vegetable oil and place the dough ball in the bowl, flipping it over to coat with oil. Cover with plastic wrap and let rise until double, about 60-90 minutes. Once proofed, punch dough dough and divide into 12 equal sized pieces. Roll each piece into a ball and place in a well-buttered glass or ceramic 13 x 9 inch pan. Let buns rise until they are fluffy and touching each other, about 30-45 minutes. Meanwhile, preheat oven to 350. Once the buns have risen again, whisk 1 egg and a tbsp of water and brush on the tops of the buns. Bake for 20-25 minutes, or until golden on top. Cool in the pan for at least 15 minutes before removing.